Hi everyone! TicTacToe always brings a huge amount of variety to the gallery and this week is no exception - your entries were so varied and I've loved visiting you all! So many bright florals, wonderful masculine inspiration and lots more besides. But before we get to my choice for Headliner, let's see what caught the eye of the Design Team this week. 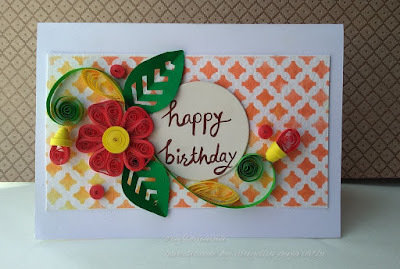 Mugdha's red and yellow quilled flower is so bright and cheery and shows lots of skill. I love the bold, green leaves and that wonderful ombre watercolour background that adds even more visual interest, whilst allowing the florals to take centre stage. Paired with the crisp white background this card really is so fresh and fabulously floral - congratulations Mugdha on being my headliner this week! Thank you again to everyone for playing along with us. Congratulations to all our winners, please pick up your badges here. Come back tomorrow for a pretty Theme Challenge from Nance! Thank you so much joanne for picking my card as a headliner and kind appreciation,you made my day..congrats to all 'cut above'. congrats to all the winners - and thanks Jan for choosing my card as "a cut above". Thanks so much for choosing my card as one of the "cut above" choices! I'm honouring. Congratulations to everyone else, and to Mugdha for having the Headliner card. Oh Jaydee thanks so much for the shout out! Always fun to play here! Beautiful gallery this week! Thank you so much Sandy, for choosing my card as A Cut Above! Made my day!! And congrats to all the other Cut Above and the Headliner Mugdha - spectacular creations, ladies! !